Located in Delhi, India, we are actively functioning as an eminent Manufacturer, Exporter and Supplier of Trichloroethylene all over the nation and overseas. 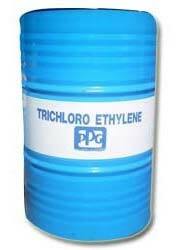 The Trichloroethylene (TCE) can be obtained from us in safe and leak proof drums. Buyers can place even the bulk orders of Trichloroethylene with us and we will definitely deliver the same on time. The chemical compound TCE is a chlorinated hydrocarbon commonly used as an industrial solvent. It is a clear non-flammable liquid with a sweet smell. TCE is an effective solvent for a variety of organic compounds. It was first widely produced in the 1920s. TCE's major use is to extract vegetable oils from plant materials such as soy, coconut, and palm. Other uses in the food industry included coffee decaffeination and the preparation of flavoring extracts from hops and spices. It is a huge advantage of TCE's that it has a high boiling point (87oC) i.e. it does not burn easily. It is especially valuable because of its cleaning properties, low flammability and lack of measurable flash point. TCE's is also used as chemical process intermediate in PVC production as a molecular weight control agent. High-purity grades of TCE's are used as feedstock in the synthesis of refrigerant hydro fluorocarbon. In this process, TCE's compound is destroyed to form new fluorinated compound. TCE's is used as a solvent in some nonflammable adhesive and aerosol formulations, and as a low temperature heat-transfer medium. However, it should be strictly noted that trichloroethylene (TCE) is highly dangerous and toxic if swallowed or inhaled and can affect heart, liver, nervous system, and kidneys. It also causes severe skin irritation and irritation to eyes and respiratory tract (May Cause Cancer). © Copyright 2012. Fine Chemicals & Scientific Co.